Tips for how to make healthier chocolate desserts. At first, the idea of creating “healthier” chocolate desserts may sound—well, plain vanilla. But in the hands of a chocolate artisan like Alice Medrich, it’s anything but. Fabulous chocolate treats don’t need to pack in the calories, as she has been proving since she first published her classic cookbook Chocolate and the Art of Low-Fat Desserts in 1994. Medrich, an oft-decorated dessert authority, knows chocolate intimately. Ever since she introduced chocolate truffles back in the 1970s at her ground-breaking Cocolat dessert shop in Berkeley, California, she’s been working magic with her favorite ingredient. Over those years scientists have been working hard, too, making sweet discoveries about the health-enhancing properties of cacao, the phytonutrient-packed solids extracted from cocoa beans that give chocolate its flavor, color and—for lack of a better word, chocolitude. Chocolate’s image has, likewise, evolved. Chocolate was once considered a wicked, guilty pleasure—remember “Death by Chocolate,” the over-the-top chocolate dessert made popular in the ’80s by Bennigan’s restaurants? But today, chocolate—particularly the darkest types that boast sky-high cacao percentages—is beginning to seem more and more like a health food. (“High-flavanol cocoa in Aisle 3!”) Eating a little bit of chocolate at least a few times a week, in fact, can be downright good for your heart, not to mention your soul. The trick is to make the most of that little bit of chocolate, while dialing down the fatty, sugary ingredients chocolate so often keeps company with. That happens to be Medrich’s stock in trade, as her glorious chocolate creations show. The pleasure begins with the best-quality chocolate. 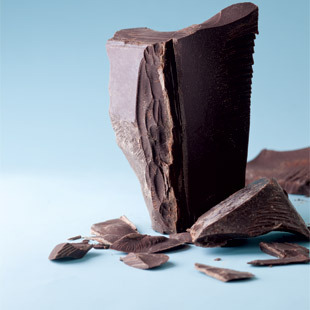 Medrich likes to use chocolate with a high percentage of cacao (cocoa solids), usually 70 percent. “There’s a lot of vibrant flavor in such dark chocolates, so you can often use quite a bit less,” Medrich notes. That trims significant calories, since most types of chocolate are about 150 calories per ounce. each to keep calories down and chocolate intensity up. “Juxtapose flavors and textures. It should be a dynamic and exciting experience to eat,” she advises. She’ll drizzle a dense chocolate glaze over a chocolate cookie or combine cocoa powder and chocolate chips. She might add flavorings that complement and enhance chocolate, like coffee, cardamom or nutmeg. “But my favorite way to add flavor is to sprinkle it on top,” as she does with cinnamon and ancho chile powder for Chile-Cocoa Graham Crackers, “so that it creates an aroma before you take a bite,” she says. “The lingering flavor is chocolate, but you’ve had a more interesting and complex experience.” The combination of citrus and chocolate can also create magic; for proof, just try one perfumed bite of Chocolate Decadence with its candied-orange-peel garnish. Though she’s kept an eye on moderation, Medrich likes to think of the following recipes as indulgences, steering clear of the idea of eating chocolate for health reasons. “We all need to have some indulgent things in our lives that please us,” she declares. “That in itself is healthy.” We heartily agree.